This spaghetti and meatballs recipe is made to be shared! 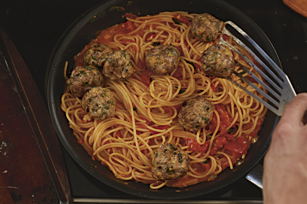 So gather 'round the dinner table, and enjoy this Family-Style Spaghetti & Meatballs! Combine panko and seasonings in large bowl; stir in cheese. Reserve 2 Tbsp. cheese mixture for later use. Add next 5 ingredients to remaining cheese mixture; mix just until blended. Shape into 12 meatballs, using 1/4 cup meat mixture for each. Place on baking sheet sprayed with cooking spray. Bake 22 to 25 min. or until done (165ºF). Meanwhile, cook spaghetti in large saucepan as directed on package, omitting salt. Drain spaghetti, reserving 1/2 cup cooking water. Return water to pan; stir in tomatoes and garlic. Cook on medium heat 3 to 5 min. or until tomatoes are tender, stirring occasionally. Add pasta sauce, basil and cream; mix well. Add spaghetti; toss to evenly coat. Serve spaghetti mixture topped with meatballs and reserved cheese mixture. We revised this recipe to use KRAFT Shredded Cheese, SHAKE 'N BAKE Coating Mix and seasonings. Our Kraft Kitchens team has developed substitutions for the entire FRESH TAKE lineup so that you can continue to enjoy the great taste of these products. Click here for our Classic Four Cheese substitution guide. For easy cleanup, cover baking sheet with foil sprayed with cooking spray before using as directed. After shaping meatballs with your hands, be sure to wash your hands thoroughly with soap and hot water for at least 20 sec. A quick rinse under the faucet is not enough to kill any harmful bacteria.